Naming your business can be tricky. Consider these essential tips while choosing a spiritual company name! Implementing spiritual logo design in the conscious space for 2 years, I have heard and resonated with many of you! Joining two relevant words - an adjective followed by a noun. For example: "Love-charged Coaching", "Kollected Kinesiology", or "Heart-based Healing"
Helpful Hint: Repeating the same first letter of two words makes the name more memorable! Consider the energetic value you bring to your clients. This may help you decide what feeling your business name should portray about you. Write your energetic values down and explore alternate words to the ones you've written using a thesaurus to help you. There may be a word in there that says, "use me!". If you provide a personal, one-on-one service like Tarot Readings, or healing sessions for example, it is appropriate to consider your name or spirit name (for mash up of both!) for your business name. This can encompass the personal nature of your service and radiate this to your audience directly! If you’re a one-on-one service, try to avoid using the term “we” in your company descriptions. It's tempting to say "we are a healing business..." with the subconscious intention to feel established. But this can direct readers to the impression that you're a team of specialists rather than a specialist yourself! To portray yourself as unique, personable and approachable, use direct, personal language. If the client is most likely going to have contact with you and only you, try saying “I” instead. Instead of "We give you space to feel your true self”. try; "I give you space to feel your true self”. This business is likely going to be a big part of your life so this is an important task for you. But also fun and exciting! Have fun with is and be playful in the words you explore. There are no wrong answers here! Actually, the most impactful business names can be taken from the most absurd answers! Be brave, expand your wings and let's see what you've got! Consider the energy or feeling you'd like to portray to your audience. 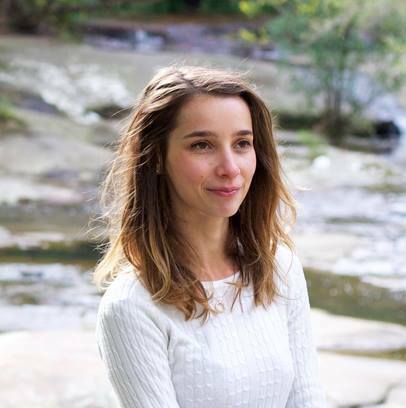 Irene Emily is a Graphic Designer for healers, life-coaches and conscious change-makers. Her life-long interest of inner-work gives her a unique understanding of the relationship between design and its audience. She thrives on empowerment and seeing transformation in others. Underlying graphics with spiritual, self-exploration, Irene Emily exercises her gift of crafting Devine Design with some of the most well-known figures in the conscious community.